The US-led propaganda campaign against the Syrian-Iranian-Russian alliance has reached a new level as the Syrian Arab Army (SAA) is openly preparing to kick of a ground assault on terrorist groups in northwestern Syria. “when Russia and the Assad regime say they want to counter terrorism, they actually mean they want to bomb schools, hospitals, and homes. They want to punish the civilians who had the courage to rise up against Assad.” She further stated that “the Assad regime” must halt an offensive in Idlib because it will undermine “peace talks”. “We consider any assault on Idlib to be a dangerous escalation of the conflict in Syria. If Assad, Russia, and Iran continue, the consequences will be dire,” Haley said. On the same day, CNN released another fabulous report based on anonymous US defense officials. According to the report, Russia warmed the US-led coalition twice that its forces and the Syrian military are prepared to attack terrorists in the 55-km zone claimed by the US-led coalition around its military garrison at al-Tanf. CNN speculated that this attack may endanger US troops deployed there, but did not elaborate how it is possible if US personnel are not embedded with terrorists. Following the report, the coalition kicked off a military exercise involving 100 US servicemen in the al-Tanf area. “Our forces will demonstrate the capability to deploy rapidly, assault a target with integrated air and ground forces, and conduct a rapid exfiltration anywhere in the OIR combined joint operations area … Exercises like this bolster our defeat-ISIS capabilities and ensure we are ready to respond to any threat to our forces,” CENTCOM spokesman Navy Captain Bill Urban stated. 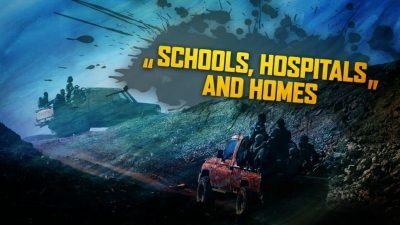 On September 8, clashes erupted between a unit of the Syrian Military Intelligence and security forces of the US-backed Syrian Democratic Forces (SDF) in the city of al-Qamishli. Kurdish sources claimed that clashes erupted after government troops had entered the SDF-controlled area without a permission. Pro-government sources say that the SDF attack had been pre-planned. 12 government servicemen and 7 SDF personnel were killed in the incident. On September 9, the SDF’s political wing, the Syrian Democratic Council, released a statement claiming that it regrets the incident. “The coincidence of this incident with the summit in Tehran is questionable,” the SDC added in the same statement de-facto accusing Syria, Russia, Iran and Turkey of the escalation. Meanwhile, multiple reports have been released by pro-militant media activists and mainstream media outlets on alleged civilian casualties and damage to the civilian infrastructure as a result of the airstrikes of the Syrian Air Force and the Russian Aerospace Forces. The reports came when Syrian and Russian forces expanded their airstrikes on targets belonging to Hayat Tahrir al-Sham (formerly Jabhat al-Nusra, the Syrian branch of al-Qaeda) and the Turkistan Islamic Party in northern Lattakia and southern and southwestern Idlib. A source in the 4th Armoured Division of the Syrian Arab Army told SouthFront that these strikes are preparations for a ground phase of the offensive in the area. However, no details when it’s set to be started were provided.